Explanation: Last Thursday the view toward sunset from the 2.5 kilometre summit of Cerro Las Campanas in the remote Chilean Andes was amazing. Bright but fading Mercury stood very close to a two day old Moon. Both a sunlit lunar crescent and earthlit lunar nightside are captured with the fleeting innermost planet in this breathtaking mountainscape. 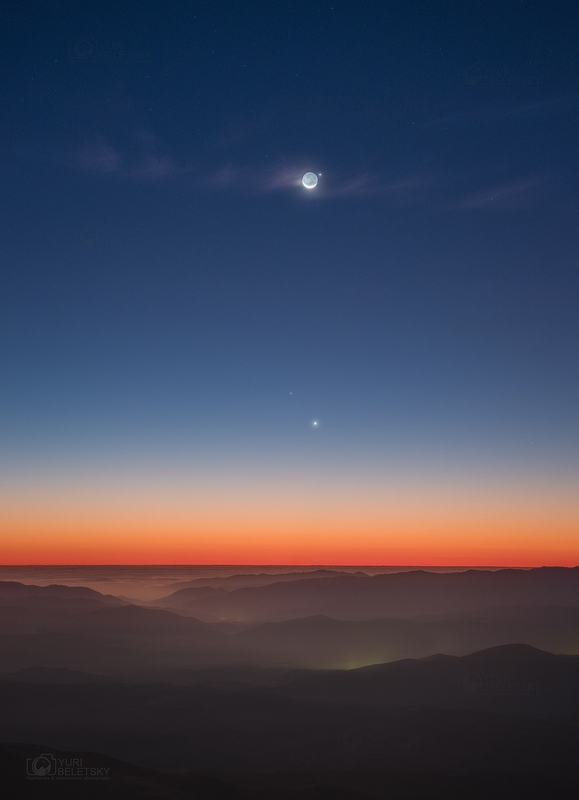 Even below the conjunction of Moon and Mercury, a close pairing of brilliant Venus and bright star Regulus hangs in the sky, still above the colourful western horizon. Of course amazing skies above Las Campanas are not unexpected. The region is currently home to the twin Magellan telescopes of the Las Campanas Observatory and the summit location is the site of the future Giant Magellan Telescope.